Amyotrophic lateral sclerosis (ALS) is a motor neuron disease that impairs the nerve cells that control voluntary muscle movement. As these nerve cells gradually deteriorate, the muscles that control walking, talking, and chewing get weaker. ALS is a progressive disease, which means that while some symptoms may slow or stop periodically, overall progress is inevitable. There is no cure for ALS. In the United States, 15,000 – 20,000 people have ALS at any given time. More than 6,000 Americans between 40 and 70 are diagnosed every year. Slowly but eventually, ALS prevents patients from walking, dressing, writing, speaking, swallowing, and breathing independently. However, medication, certain therapies and other support can ease symptoms and prolong life if adopted early enough. Caregivers, home care aides and loved ones need to know the risk factors, signs, and treatments of amyotrophic lateral sclerosis. May is ALS Awareness Month in the United States, but this disease has taken the public stage more often than most in recent years. Of course, ALS is also commonly known as Lou Gehrig’s Disease, for the famous 1920’s and 1930’s Yankees first baseman, nicknamed the Iron Horse for his strength and stamina. Cruel irony caused him to develop ALS, and Gehrig retired in May 1939 because the disease was affecting his play. Even his retirement speech “Luckiest Man on the Face of the Earth” is famous. In the summer of 2014, the Ice Bucket Challenge swept social media, and no timeline was safe from videos of people dousing themselves or others in huge buckets of ice cold water to raise money for ALS research. And of course, physicist Stephen Hawking, the second-most famous ALS patient ever, passed away in March 2018, 55 years after his diagnosis at age 21. He did his most brilliant research, study and writing after his diagnosis, defying all odds and statistics. ALS is a neurodegenerative disease that progressively impairs the nerve cells in the brain and spine that control voluntary muscle action. When the damage to the nerve cells goes too far, they die, and the brain loses its ability to move those muscles or move them with purpose. As the degeneration and nerve cell death progress, patients gradually lose their power to speak, eat, move and even breathe. ALS has two forms, sporadic and familial. Sporadic ALS, accounting for 90 to 95 percent of all cases, is the most common form of the disease in America. It can strike anyone, anywhere. Only 5 to 10 percent of all U.S. cases are Familial ALS (FALS). This form of the disease is inherited, and in an affected family, each child has a 50% chance of inheriting the FALS gene mutation. ALS is a progressive, degenerative disease with no cure that gradually steals patients’ ability to perform basic functions. With 20,000 American current patients suffering from ALS, the disease isn’t widespread. But some very famous people and movements have brought ALS into the news and our minds. 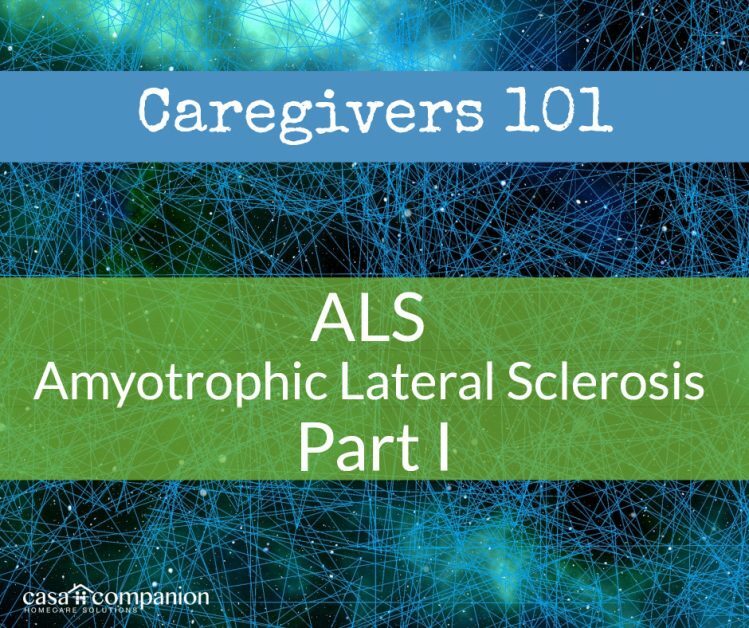 Next month in Caregivers 101: Amyotrophic Lateral Sclerosis (ALS) Part 2, we’ll review the risk factors, symptoms, and treatments for ALS. Caregivers, home care aides and loved ones should all be aware of the signs that could indicate the early stages of ALS, because early detection offers the most independence and slower progression of this disease.